What’s the best technology to sign-up new participants? 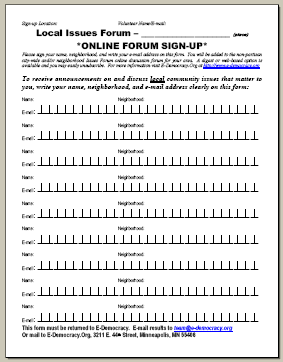 Updated sign-up forms was written on February 1, 2008 and filed in All, Issues Forums, Local, Neighbor Neighbourhoods, Technology, UK, US. There are 5 comments so far, feel free to post a comment of your own. Update – See our directory of print materials including new sign-up forms and note the links at the bottom of this page for related outreach resources. After over a decade of experience, we are going to let you in on a little secret. Shhhh. A common assumption when launching a new local forum or promoting a recruitment drive is that most participants will find the website through various promotions and sign-up. Bullarky. We’ve found that the best way to reach the 100 registered members required to open a new forum or to increase a forum by 20 or more members in one swoop is through paper. Yes, paper and a clip board. Paper is the appropriate technology for hyper-local outreach. The key of course is to use this magical technology at the right locations. In Minnesota our major political parties have precinct caucuses on February 5th. While most people will have choosing the next president on their mind, these are great events for our participants to print a sign-up form, pass it around, and then send us the results. One extremely important lessons is to make sure your encourage people to write their e-mail addresses clearly. For those making their own sign-up forms for other purposes, the boxes we use for letters work well. We’ve found that straight lines can lead to up to 25 percent of sign-up being illegible. Quite right. It is very easy for hyper e-enabled folk who work in the field to forget the basics of pen and paper. We’ve debated in the past of not printing access code cards for I’m a Councillor, (www.bigvote.org.uk) but a little piece of card with a code on really helps make it special.